Brookside Equity Partners is a private equityPrivate Equity FundsPrivate equity funds are pools of capital to be invested in companies that represent an opportunity for a high rate of return. They come with a fixed investment horizon, typically ranging from 4 to 7 years, at which point the PE firm hopes to profitably exit the investment. firm that makes direct investments in middle-market companies. It specializes in leveraged buyouts, recapitalizationRecapitalizationRecapitalization is a type of a corporate restructuring that aims to change a company’s capital structure. Usually, companies perform recapitalization to make the capital structure more stable by exchanging one type of financing for another. One example is when a company issues debt to buy back equity shares., add-on acquisitions, strategic acquisitions, and fund of funds investmentsFund of Funds (FOF)A Fund of Funds (FOF) is an investment vehicle where a fund invests in a portfolio composed of shares of other funds rather than investing directly in stocks, bonds or other securities. The strategy of investing a fund of funds aims to achieve broad diversification and asset allocation in small, middle-sized, and mature companies seeking long-term capital. Brookside invests mainly in North American companies, even though it also seeks investments in Asia and Europe. The firm does not limit its investments to specific industries, but it prefers to take part in manufacturing, business services, financial services, consumer businesses, plastics, specialty manufacturing, and specialty chemicals. Brookside participates in co-investments, where they partner with other like-minded investors to invest in the same portfolios. The firm prefers partnering with investors who bring value-added industry expertise and relationships. By partnering with other investors, it is able to invest in a wide range of industries, deal types, and special situation opportunities. 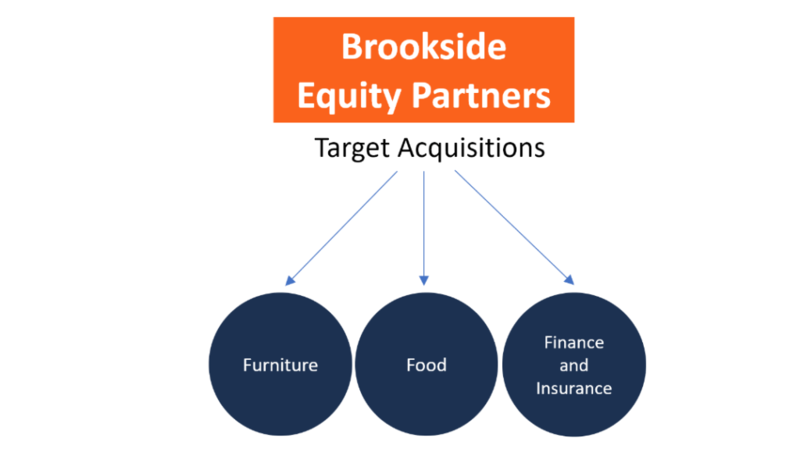 Brookside and its co-investors often seek add-on acquisitions to add to their portfolio of companies. Add-on acquisitions allow companies to provide complementary services, new technology, or expansion that can be integrated into the company’s existing infrastructure with ease. An add-on acquisition involves the acquisition of smaller companies with less financial infrastructure. The acquirers will pay lower-end valuation multiples to acquire the infrastructure. Sometimes, companies may acquire other lower to mid-sized competitors to increase their product offerings, customer base, and market share, or to expand to new geographical markets. Brookside’s usual investment criteria may not apply to these types of investments. Furniture: Brookside considers furniture designers, manufacturers, importers, and distributors where the owners wish to retire or take passive roles in management. The firm prefers companies within the $5 million to $40 million range, although this is not mandatory. Food: Brookside considers manufacturers of food flavorings and intermediate food ingredients that are focused on dry and liquid flavorings for food or beverage products. To be considered for add-on acquisitions, companies in this industry must report a minimum of $3 million in revenues. Finance and insurance products: Brookside considers administrators, underwriters, and originators of financial and insurance products that cater to automotive owners, mainly vehicle service contracts and other products. Brookside invests its capital in high growth companies that give it both majority and minority positions. Majority positions give the company a major control in the affairs of the company, while a minority position gives the company less control but still puts it in a position to contribute to making critical decisions. As a direct investor, the firm’s principals work with the management to create strategic initiatives such as new acquisitions, new product introductions, and market expansion to create long-term value. Brookside selectively invests in funds that demonstrate their ability to generate attractive risk-adjusted returns. It prefers funds that have already existed for a long time, but occasionally considers first-time funds as well. Brookside considers the following types of funds: leveraged buyoutsLeveraged Buyout (LBO)A leveraged buyout (LBO) is a transaction where a business is acquired using debt as the main source of consideration. An LBO transaction typically occur when a private equity (PE) firm borrows as much as they can from a variety of lenders (up to 70-80% of the purchase price) to achieve an internal rate return IRR >20%, mezzanine funds, growth capital, and special opportunity funds. Brookside maintains relationships with other intermediaries such as investment bankers and business brokers in North America. Sometimes, the firm works with intermediaries who have ready clients seeking the buy-side and sell-side services offered by Brookside and negotiate the fees on a deal-by-deal basis. Donald Hawks is the co-founder of Brookside Equity Partners and serves as the managing director and president of the firm. His main role is overseeing the investment activities of the firm. He also sits as a director for several private companies, such as Ampex Corporation, Dimex LLC, Seal Industries, Inc., Mainstream Communications LLC, MainStreet Media Group, LLC, and Super Color Digital, LLC. Hawks is also a member of the investment committee of the Rockefeller Family Fund. Before establishing Brookside Equity Partners, he served as a Strategy Consultant at Monitor Group, where he advised clients on various strategic areas such as mergers and acquisition, international expansion, outsourcing, and development of marketing strategies. An alumnus of Georgetown University, Hawks also holds an MBA degree from the Wharton School. Raymond Weldon is the co-founder and managing director of Brookside Equity Partners. He started his career with the Brookside group, the predecessor of Brookside Equity Partners, as a tax and transaction services advisor at PricewaterhouseCoopers. At the Brookside Group entities, he invested in private equity, co-investments, real estate, and public markets. Weldon also previously counseled middle-market clients, merchant bankers, and publicly-held companies on mergers and acquisitions and debt restructuring, as well as on domestic and international tax matters. He also serves as a director of multiple companies, including Ampex Corporation, Seal Industries, Inc., and Cardiff Holdings Corporation. A graduate of LaSalle University, Weldon also holds a Master’s in Taxation from Villanova University. Richard Dell’Aquilla serves as a managing director at Brookside Equity Partners. He is involved in all investment activities carried out by the firm. He also serves as the director of several private companies, including USA Discounts Ltd, Superior Auto, and Newhall Laboratories. Before joining Brookside, Dell’Aquilla served as a managing director at Parallel Investment Partners, where he was involved in deal sourcing, structuring, as well as in managing and exiting several private equity investments. Dell’Aquilla’s other previous work experience includes serving as a principal at Southfield Capital Advisors, research analyst at Sasco Capital, and financial analyst at Bear Sterns. He is a B.A. Economics graduate from Hamilton College and also pursued undergraduate studies at Oxford University.